I decided that I needed to make Anzac Biscuits using my Anzac Slice recipe that I created last year. I already have a Healthy Anzac Biscuit recipe on my blog, however it uses oats and butter, so I really wanted a biscuit recipe on Becomingness that was gluten, dairy and refined sugar free. 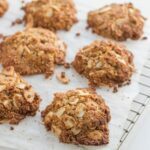 These Anzac Biscuits are so yummy! Delicious in fact! Mix together the almond meal, flaked almonds, shredded coconut and coconut sugar in a bowl. Next pour in the liquid mixture and mix thoroughly. Bake for 13-15 minutes, or until golden. Transfer to a cooling rack and allow to cool completely.